COTTON planting in southern New South Wales has begun, with preliminary estimates indicating the area could be down by up to 30 per cent on last year because of uncertain prospects for irrigation entitlements. However, this has not dimmed longer-term prospects for the continued expansion of cotton in the region where a new gin for the Murrumbidgee Valley has been proposed by Southern Cotton, in conjunction with a new entrant to southern NSW production, Queensland Cotton. Southern Cotton already operates a gin at Whitton. The new facility slated for Coleambally is expected to gin its first cotton in 2020 to supplement additional ginning capacity in southern NSW held by Auscott at Hay, Namoi Cotton at Hillston and an expanded RivCott at Carrathool. “We have identified access to ginning as a bottleneck for industry expansion in the southern valleys, and a new cotton gin in Coleambally is our way of getting in front of the problem,” Southern Cotton chairman, Larry Walsh, said in a statement last month. The Coleambally gin will be the southernmost in Australia. Bayer regional business manager for southern NSW, Luke Sampson, said it was likely to enable further growth in cotton production. “That will be a great support to areas further south, like Conargo, Jerilderie and Deniliquin,” Mr Sampson said. Last year, southern NSW planted its biggest ever cotton area of 71,400 hectares yielding 800,000 bales. Grower numbers hit 163, up from 110 in the previous year. Mr Sampson said prospects for new crop were “not too bad” considering Murrumbidgee irrigators were currently entitled to only 7 per cent of their allocation, and Murray irrigators zero. 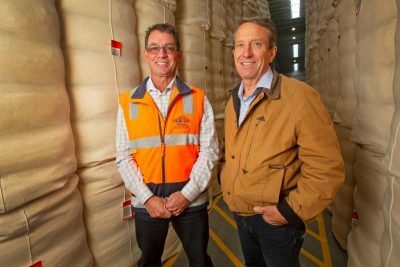 “Planting intentions now say the Murrumbidgee is looking at 47,000ha of cotton, but I think that is if all goes well, and there’s an increase in water allocation, and no rise in the price of water. Bayer’s figures said NSW irrigators with a licence from the Murray River were expected to plant about 3000ha, down from 4400ha last year. Mr Sampson said many growers were carrying over 10-20pc of their allocation from last year, and some were able to irrigate from bores. Melting snow and anticipated spring rain are both likely to boost entitlements to around 30pc, but Mr Sampson said growers were fearful of having to buy water in the peak-demand months of January and February if that did not eventuate. He said he believed growers had sufficient water to produce the cotton they had forward sold, but the expense of buying supplementary water made establishing additional area a risky proposition based on the current water market. Water is currently priced at around $340 per megalitre (Ml), down from $380/Ml last week, but Mr Sampson said more upside than downside was currently seen. “If it’s $400/Ml next week when they go to plant, they might be better off selling their water and getting out of their contracts rather than growing cotton, but at $340/Ml, they will grow the cotton rather than sell the water. The Lachlan Valley, where the Hillston gin is located, forms the boundary between southern and central NSW, and is currently forecast to plant 13,000ha of cotton, down from 18,000ha last spring.